A selection of films from the EYE Film Institute, Amsterdam. All films will be shown in 35mm. Titles are in Dutch with live simultaneous translation. Live musical accompaniment by David Drazin. The Night Sky (Artemis Willis, 2012, Blu-Ray). A lantern-slide presentation of the wonders of the universe, featuring digital animations of astronomical lantern slides from the Adler Planetarium, music of the spheres, and Terri Kapsalis in the role of the lecturer. All films will be shown in 35mm. Titles are in Dutch with live simultaneous translation. Live musical accompaniment by David Drazin. A Pictorial Story of Hiawatha (Katharine and Charles Bowden, 1904). A partial reconstruction of Katharine and Charles Bowden’s illustrated lecture (1904-08), organized by Andrew Uhrich and Artemis Willis. Featuring original lantern slides from Valparaiso University, 35mm restorations from Chicago Film Archives, lantern projection by Terry Borton, and musical accompaniment by David Drazin, based on music composed by Frederick R. Burton for the Hiawatha pageant performed in Desbarats, Ontario by the Garden River Ojibway community from 1900 to 1904. Early cinema emerged within a visual culture that comprised a variety of traditions in art and image making. Even as methods of motion picture production, distribution, and exhibition materialized, they drew from and challenged practices and conventions in, for example, photography and painting. This rich visual culture produced a complicated, overlapping network of image-making traditions, innovations, and borrowings amongst painting, tableaux vivants,photography, and other pictorial and projection practices. Film and media scholars have created the concepts of “intermediality” (Gaudreault) and “media archaeology” (Mannoni, Zielinski, et al) in order to account for such crisscrossing traditions and to work against an essentialist notion of film, while other disciplines have suggested ideas, such as “image-system” (Barthes) or “an ecology of images” (Sontag), to conceptualize the dynamic relationship between images and their context. 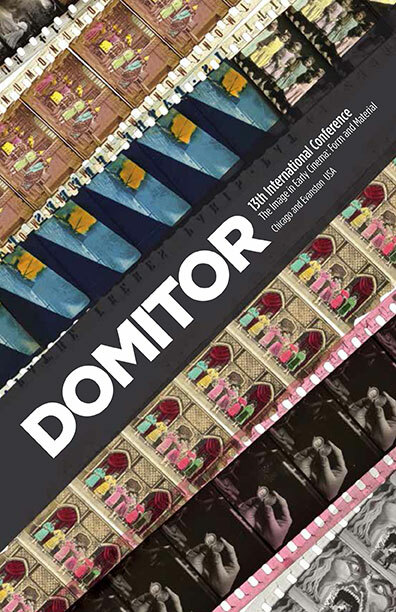 Continuing in this vein, this Domitor conference seeks to trace the various interactions involved in forming a new moving-image culture, using the broad category of “the image” to examine intersections between visual culture broadly conceived and early cinematic form, technology, theory, and practice. Embracing issues involving both cultural forms and material technologies, we invite proposals that employ a range of approaches—from the methods of art history (including formal, social, and political approaches), to the nitty-gritty of archival research into the materiality and technology of the medium. Although we imagine the general time frame for the period covered by papers in the conference to be 1890 through 1915, we realize that cinema developed unevenly across the global stage. For that reason, papers treating cinema after 1915 in countries where early cinema practices postdate the proposed time frame will be given full consideration. Similarly, papers that examine the history and current status of early cinema’s place in the archive and museum are also welcomed. Proposal Submission Process: Those wishing to submit a proposal should do so no later than 1 December 2013 to: domitor2014@gmail.com. Any questions about the process should also be sent to that address. Proposals for individual papers should be no longer than 300 words and be written in either English or French. Only a paper written in one of those two languages can be presented at the conference. Papers prepared for conference delivery should be no longer than 3300 words and must fit within a 25-minute presentation time (including any audiovisual material used to supplement the paper). We request that all papers be submitted by30 April 2014 to allow for simultaneous translation. Unfortunately, proposals for presentations that are not in keeping with the theme will not be considered. Proposals for pre-constituted panels of three participants will also be considered; such proposals should be submitted by the panel chair and consist of the collected individual paper proposals in addition to a brief rationale for the pre-constituted panel. While membership in Domitor is not required to submit a proposal, anyone presenting a paper at the conference must be a member. To become a member, please go to our Membership page.